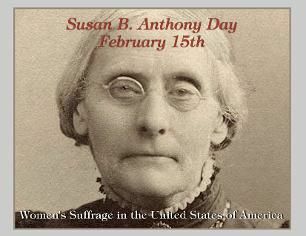 February 15 is Susan B Anthony Day - Susan B. Anthony Day is a commemorative holiday to celebrate the birth of Susan B. Anthony and women's suffrage in the United States. Do you think women take for granted the right to vote? Do you think other women should also be celebrated for giving women the right to vote? I think some people, both women and men, do take for granted the right to vote. Voter turnout should be much higher than it actually is. Personally, I didn’t always vote when I was younger, but as I got older I realized the importance of it, and now I always vote. It is both a right and a responsibility as a citizen. As for whether other women should be celebrated for giving women the right to vote, I’m sure a lot of women contributed to the cause. Unfortunately I hardly know anything about the history of it. I don’t think I was ever taught about it in school. I wish more people would learn about the candidates and take voting seriously. Nice blog. 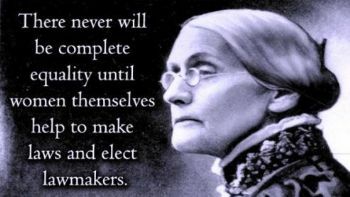 Sad to say, I knew very little about Susan B. Anthony or other women who helped give women the right to vote. I also didn’t vote in my younger years, but I do take that responsibility very seriously now. I have voted every year since I turned 18 EXCEPT for one year when I had the flu so bad getting out of bed was impossible. Can't remember now if I didn't vote for a President or a Governor of my State. If people don't vote, they have no business complaining about the government, or even praising it! I too think both men and women take for granted the right to vote. Although, if everyone got the day off to vote maybe the voting turnout would be higher. Elizabeth Cady Stanton is another woman that was involved with the suffragette movement. She was such an inspiration!